It brings the outdoors in. Sliding glass doors come with large glass area and rather narrow frames. This configuration allows you to gaze at your backyard and surrounding landscape without even leaving your home. The perfect combination of framing and glass also captures views so nicely. It provides easy access to outdoors. Because the glass panels slide effortlessly to the side, you can easily go outside your patio or inside any room in your home. The unit doesn’t require swing space so it won’t interfere with entryways or nearby furniture. It is visually appealing. Aside from framing a picturesque view, sliding glass patio doors complement most contemporary home styles. The units installed by Renewal by Andersen of Atlanta come in a wide range of colors and finishes that will enhance your home’s curb appeal. You can also choose to add grille options for extra charm. It is energy-efficient. Our patio and entry doors in Atlanta use high-quality glass packages that help with insulation inside the home. Our sliding patio units feature High-Performance™ Low-E4® glass for maximum energy efficiency. This glass has special coatings that reflect heat and harmful rays, keeping your home cool during hot days and warm during winter. It ensures safety. Our sliding doors come with a reach-out locking system that fits the units tightly into the jamb. This not only creates a secure lock for optimal safety but also ensures a tight seal for better weather protection. 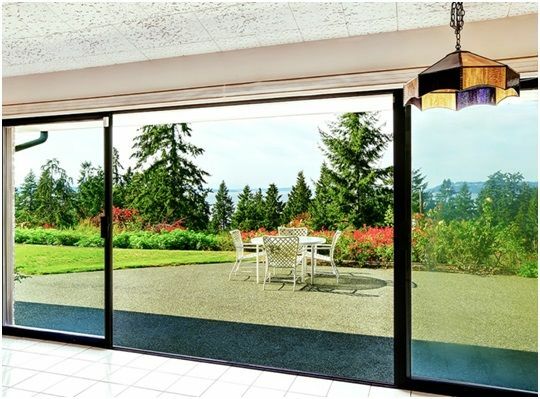 In essence, sliding patio doors make a cost-effective investment. With Renewal by Andersen of Atlanta, you can be sure that your patio door will be appealing, energy-efficient, safe, and durable. Our replacement doors also come with a fully transferable warranty, with each component having a different coverage. Call us today at (888) 908-3332 to learn more. You may also fill out our contact form to get a free estimate on any of our door services.